Affordable Accoutrements: Came Home with the Blues Today! It's time again for Today's Thrifty Treasures! Please join our hostess for the always- fun event, Rhoda of Southern Hospitality. Please take time to visit all the smart-shoppin' participants and let Rhoda know how much we all appreciate her hospitality. I picked up a few bargains this weekend. My first stop was the Kroger supermarket. There’s not much blooming in the garden right now, so I checked out the reduced items in their floral department. I had white flowers in mind and found this bouquet reduced from $25 to $3.99. I’ll mix in garden flowers to make a centerpiece for the dinner table. Next I stopped by my favorite thrift/junk store (the one that sells abandoned items from storage units). I found two DVD’s for $2 each. One of them is a “double feature,” so that’s 3 movies for $4. I picked up four vintage cookbooks (produced by Better Homes and Gardens and Southern Living). They were 50 cents each. They’re displayed on vinyl-clad plate stands. The plate stands, the feathered bird ornaments, the ceramic fish that holds a tea light candle, the little round decorated box, the metal basket of potpourri, the metal clipboard, the set of blown glass Christmas ornaments, and the set of clear lights totaled $3. So the total for everything in the two photographs was $9. On the way home I stopped at Goodwill. It was their half price Saturday event, so everything was on sale. I found a box of blue glass dishes that didn’t have a price. I stopped an employee to ask how much they would be. She went in the back and returned with a $14.99 sticker. With the 50% reduction, that made it 44 pieces for $7.50. I also found two crystal ashtrays for 99 cents each. They’re heavy, very sparkly, and make wonderful wine bottle coasters. I feel a tablescape coming on!!! Total spent: $18.50 plus $3.99 for the flowers. How do you think I did? Love the dishes! You did great! Our local GW stores never have a half-off sale! That would make my purchases a lot less painful, because they have a habit of marking merchandise as if it was regular retail, not used. The cobalt blue is beautiful. I like the idea of old ashtrays used as wine coasters. Bill, those are beautiful flowers! Wish we had Kroger here in B'ham, I miss the competition with Publix that they have in ATL. And oh my, look at you buying more dishes. What a deal those were & I bet you will come up with a stunning tablescape for those. Happy hunting! I'm thinking of your silver chargers with the blue dishes. Oh and as usual I think you stole everything. What great deals. Dang, Bill - you have the best luck!!! The blue dishes are wonderful. I love old Christmas decorations! I get most of my fresh flowers at Kroger, too. They have great prices anyway, but you gotta love the mark downs. Score!! I am coveting the blue dishes. Well done!! Why, Bill....you came out smelling like a rose. Great bargins here. I could just have a hissy fit over those blue dishes. They are going to be just magnificet in one of your pretty tablescapes. Can't wait. O, and thanks for the tip on the crystal ash trays. I never thought about wine coasters ...no telling how many pretty ashtrays I've passed up because I quit smoking 7 yrs. ago. I think you did great! Especially on those blue dishes - they are beautiful. Hope you are having a great weekend. Gosh wonderful! One of these days - I think I'm just going to send you $20 and tell you to "surprise" me -- and then just sit back and wait to be delighted -- you always find the best treasures! Great job! You find the best deals. The blue dishes are great and the flowers too. I can't wait to see what you do with it all. Wow...as my sister would say, I hope you were wearing a mask when you made off with all those dishes for that price! Awesome deal...those are going to be great in a tablescape! I like the idea of the ashtrays as wine coasters! you find the best stuff! I want to go shopping with you. 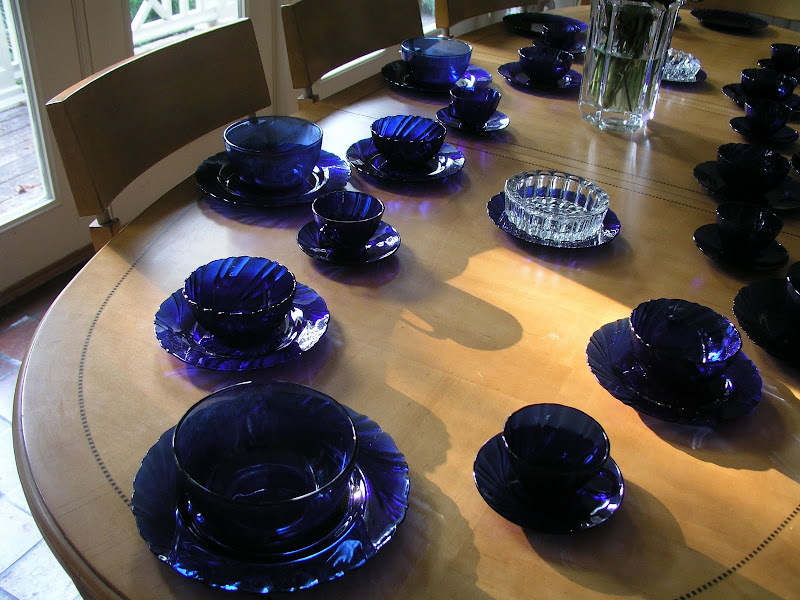 My mom has some cobalt blue dishes on glass shelves in her kitchen window- they look so pretty with the sun shining in. and the vintage cookbooks are great - their are my favorite to look through when I need a recipe. Well done, you do have an eye for a stylish bargain. Thanks for sharing a peek into your finds and inspiring us all to look for treasures. You found some great stuff! LOVE the blue!! Hi Bill, how ever do you find such great stuff? Here's an idea for you, I think you need to gather your faithful followers together and have a tour of all your shopping haunts. Promise to think about it? Oh I love those dishes! And I love to pick up the glass and crystal ash trays myself for coasters...once my dad stopped smoking, that's what we used our multitude of ash trays for...I have a glass plate that really is to be used for a pillar candle..burned the candle..hmm, that appears to be the exact same size as my battenberg lace coasters...voila! Perfect fit! And Nannykim, as far as I know, all GW stores have a 50% off day at least seasonally. Maybe get on a mailing list for your store or ask one of the employees. I am not in our GW weekly (usually) so I have been lucky when I find out about them. My love to the 'girls' Bill! Awesome Bill! Those blue dishes are gorgeous and normally they won't price anything on the weekends for you, you just have to come back. You did great on the flowers as well. Thanks so much for commenting on my post about my cousin Stella. I appreciated it so much. 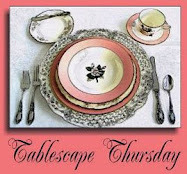 Have a great week and I can't wait to see that table scape. I think you hit the jackpot! I can't believe you picked up the set of dishes for 50% off! What a deal! 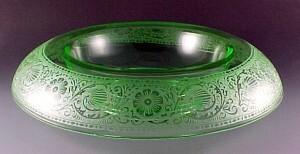 I like the glass ashtrays too, great idea to be wine coasters. Thanks again for sharing...always a treat! Hi Bill what great bargains!! I love everything you bought. I think I will have to have a good look round when we are out and about in England. It is usually antique shops I look in, but perhaps I should look in our "Charity shops" I know I give good stuff to them. 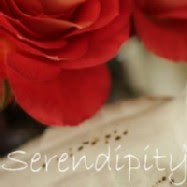 I am looking forward to receiving some napkins that I bought from an "Etsy" shop, SnowyCreekDesigns.etsy.com . Looking forward to your next tablescape!! Thank you for sharing all your great finds each week, can't wait to see the tablescape that you create with these fabulous colbalt blue dishes. I'm going to miss Kroger, if we move to the lake. I love the flower bargains! Great deals besides but man on man on the flowers! Holy cow, I never get those kinds of deals for that kind of find! Congrats and happy Thrifty Treasures Monday! Fantastic! Great finds! I love it all! Those dishes are fabulous! What a find at a great price! Gotta love those 50% off sales! omg! I absolutely LOVE your blue glass find. jealous! jealous!